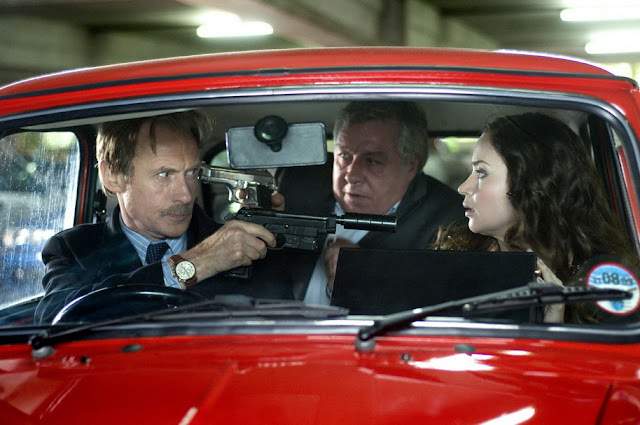 Wild Target is one of those comedy films that puts all the nice fluffy laughs in its trailer and hides the creepy Bill Nighy foot massages in its full runtime. Fine. Maybe there aren't a huge slew of films that do exactly that but Jonathan Lynn's comedy does suffer from the affliction of so many films by not producing the ratio of solid laughs the trailer leads you to expect - sure, this might mean the marketing company have done their job in getting you to buy the thing in the first place, but it doesn't half leave a sour taste in the mouth. Chief amongst the film's crimes is the salubrious flirtation between Victor (Nighy, soon to be 61) and Rose (Emily Blunt, 27). Not that we have anything in particular against large age gap relationships but here it's handled with such a heavy touch that any potential romance becomes as stiff as Nighy's rather forced walk. Lucinda Coxon and Pierre Salvadori's screenplay seems desperate to manufacture some form of relationship from a story that doesn't really need it to function and having made blatantly clear that it's not going to come from drifter Tony (Rupert Grint) fairly early on, Lynn is left with nowhere to go and sets about getting there in the clunkiest way possible. When the story is not concerned with this aspect there's some nice villainy from soon-to-be Hobbit Martin Freeman and some truly excellent villainy from an under-used Rupert Everett. The two share the film's best moments, lines and jokes and Wild Target improves exponentially every time they're on screen. When we're left with Nighy, Blunt and Grint though it's more hit and miss. Early scenes bring a few well-judged laughs mingled with the odd moment of slapstick but the minute we make it to Victor's house, Lynn finds himself slowed down by the plot and weighed down by the metaphors: Victor keeps all his furniture under protective plastic covers, could that be a reference to his lonely and closed off existence by any chance? Could these two outsiders that he's bought in to his life help him to thaw out? Less Wild; more eminently predictable, occasionally subdued and often misjudged. Wild Target featured as our Trailer Of The Week once upon a time. You can check it out here.